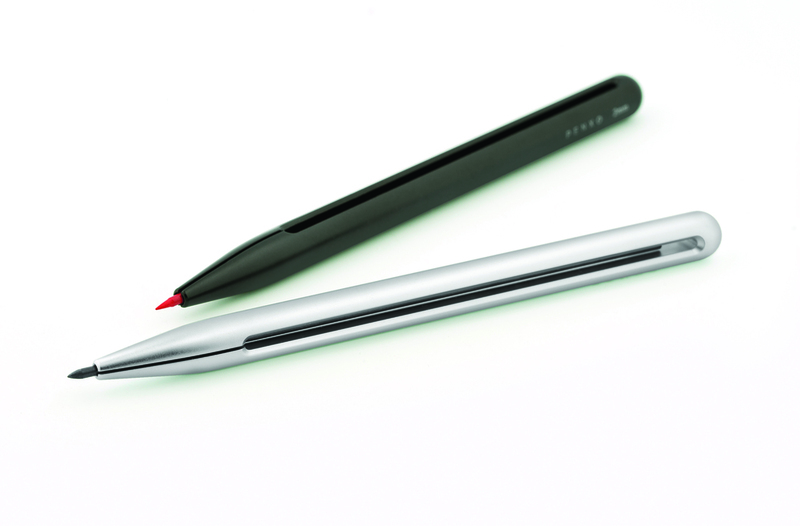 Penxo is awarded for groundbreaking design and is the top prize in the Red Dot Award: Product Design. The main concept behind Penxo was simplicity. We asked ourselves how we could reduce a conventional mechanical lead pencil into its elements and eliminate all the finicky mechanical parts. Next, we challenged ourselves to solve problems that have plagued designers for years, such as how to release the lead faster; how to make it easier to tell which lead is loaded in the pencil without the need to unload the lead, peer through a semi-translucent window, or use spinning knob indicators commonly found on drafting pencils; and how to conveniently monitor lead usage. With such challenges in mind, we went through numerous designs and concept sketches before arriving at ‘Penxo’. The Penxo is beautifully simple, stylish and unique in its handling. The simplistic design eliminates the springs, buttons, and mechanical parts found in conventional mechanical pencils. Precision milled from a single block of aircraft grade aluminium. The center window gap functions as a lead trigger release. This will greatly increase the speed of releasing pencil lead. It is the fastest lead release on any lead holder. Most 2mm leads have labels printed on it. PENXO is designed to intuitively display those labels, as well as color and usage, without needing to unload the lead or use spinning knob indicators commonly found on drafting pencils. From 4H to 4B to color leads, it will take any 2mm lead of your choice and also protects the lead securely when not in use. 6061 –T651 Aluminum – Used in aircraft construction, chosen for its perfect balance of lightweight, durability/strength and flexing properties. Each Penxo is precision milled from a single block of Aluminum. The forward cutting gap on PENXO's tip creates a pivot tension at the opposite end. This counter balance creates a clamp-like effect, providing pressure on the front tip, which secures the lead in place and prevents it from sliding out. Slide in any 2mm lead. Push your thumb between the Lead Window Gap for quick lead release. Apply light pressure on grip while writing. Easy monitoring of lead color, usage and hardness labels. 2015 PENXO. All Rights Reserved. Designed in California.